NABP has secured a special room rate at the Minneapolis Marriott City Center of $171 single/double occupancy (plus 13.15% state and local taxes). However, the special group rate at the Marriott is sold out on Wednesday, May 15. Attendees may contact the Marriott to book a room at the regular rate for Wednesday or may find rooms available at the Radisson Blu on 7th Street, which is the closest hotel to the Marriott. A limited number of rooms at the Radisson Blu are available at the group rate. Attendees may reserve a hotel room for May 16-18 at the special rate online or by calling the hotel at 1-612/349-4000. When calling, mention that you are attending the NABP 115th Annual Meeting. To ensure the special rate, reservations must be made no later than April 22, 2019. Reservations made after this date will be subject to availability and prevailing rates. Should you cancel your reservation prior to the meeting, the hotel’s cancellation policy will apply. You may contact the NABP official travel agency, Options Travel, at 1-800/544-8785 for airfare and car rental rates. Please note that the last event of the 115th Annual Meeting is the Annual Awards Luncheon, which takes place from 12:45 to 2:30 PM on Saturday, May 18, 2019. 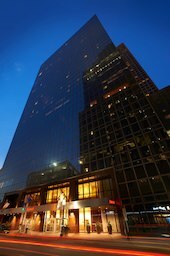 The Minneapolis Marriott City Center is located in the city’s downtown district and is approximately 12 miles from Minneapolis-St Paul International Airport. Individuals traveling from the airport to downtown Minneapolis, where the Annual Meeting hotel is located, may use airport shuttle service, public transportation, taxis, or rental cars. SuperShuttle: This airport shuttle service provides shared or non-stop rides from the airport to the Marriott, starting at $16 per person, one-way. Premium and luxury rides are also available. Reservations are required and can be booked in advance at www.supershuttle.com. Metro Transit Blue Line: Guests can take the Metro Blue Line from the airport to the Nicollet Mall station, which is only a short walk from the Marriott. The Metro Blue Line fare is $2.50 during rush hour and $2 outside of rush hour. Tickets can be purchased at the stations’ ticket machines. Taxis: Approximately $50 per person, one-way. Taxi service at Terminal 1-Lindbergh is accessible via the Tram Level (Level T). Signs direct passengers one level up to the taxi starter booth, where airport staff will assist passengers in obtaining a taxi. At Terminal 2-Humphrey, taxi service is available at the Ground Transport Center, located on the ground level of the Purple Ramp directly across from the terminal building. Rental cars: Guests choosing to rent a vehicle can select from several rental agencies located on airport property. Valet parking at the hotel is $45 per day and on-site self-parking is $26 per day. Annual Meeting attendees staying at the Minneapolis Marriott City Center may choose from several modes of transportation easily accessed nearby. Metro Transit Blue Line: The Metro Blue Line offers fast, quiet light-rail service to 19 stations between downtown Minneapolis and the Mall of America. The Nicollet Mall station is only a short walk from the hotel. The Metro Blue Line fare is $2.50 during rush hour and $2 outside of rush hour. Tickets can be purchased at the stations’ ticket machines. Minneapolis Skyway: Minneapolis is known as a very walkable, pedestrian-friendly city. The hotel is attached to the Minneapolis Skyway System, which is the largest continuous system of enclosed, second level bridges in the world, composed of 9.5 miles of pathways connecting 80 city blocks. The system connects hotels, restaurants, shopping, attractions, and more. Nice Ride: Bike rental stations are located throughout the city, with many docking stations in the area of the hotel.